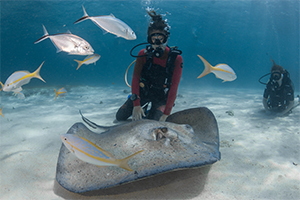 With more than 20 local stingrays who are as hospitable and friendly as any small-town welcoming committee, Stingray City gives divers the opportunity to visit a breathtaking habitat bursting with multiple species of gorgeous tropical fish. The Stingray City "districts" consist of a shallow sandbar, where guests can wade amongst the Southern Atlantic Stingrays, and Stingray City Deep, which is roughly 15 ft. deep and fantastic for divers snorkelers who want to frolic in the stingrays' habitat. Swim, explore, enjoy, and take a few selfies with the stingray locals on a dive tour with Cayman Turtle Divers. 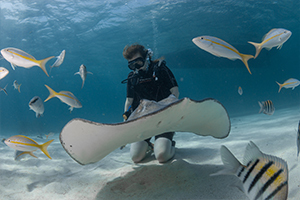 Enjoy a trip to Stingray City as part of your Grand Cayman diving adventure! We offer single-tank Stingray City diving tours as well as private charters. View our rates to learn more about exploring Stingray City! Book a trip online today!